Your organization demands actionable insights, and it needs them yesterday. But siloed channel and device data, multiple point solutions, and the inability to consistently build, measure, and activate customer profiles online and offline keep you from being nearly as efficient and effective as you need to be. Stop basing your decisions on assumptions, and start basing them on real data. Neustar PlatformOne® is a world-class, integrated marketing platform that enables marketers and agencies to deliver with precision across all marketing activities. Powered by the authoritative Neustar OneID®, PlatformOne provides a single, unbiased, and accurate view of customers and prospects, improving conversion rates, optimizing spend, and ultimately increasing sales. You don’t need a background in big data to make better decisions—you just need a partner who can provide a single, consistent view of customers across both digital and offline channels. PlatformOne enables you to grow your understanding of your business through onboarding, scoring, activation, and measurement—all from a single, intuitive interface. Break down the silos within your organization, share real-time insights, and provide true value to your organization across all of your channels. You already know the value of matching your existing CRM data to offline data. But how accurate is your onboarded data? Would it surprise you to learn that 50-70% of your data is completely erroneous, due to imprecise statistical modeling and unresolved identifiers? Neustar’s proprietary three-step onboarding process enables us to provide you the most precise, scalable, secure, and privacy-friendly data onboarding capabilities on the market. Our industry-leading OneID and extensive partner ecosystem eliminate the low-quality linkages that lead to media waste. And because we can tie multiple customer identifiers to a single target, your media strategy remains efficient and effective across all channels. Cleaner data, better reach, more effective targeting and measurement—and that’s just the beginning. You need to know your customers better than anyone—if audiences don’t work, it negatively impacts your KPIs. Neustar Customer Scoring & Segmentation™ helps you grow your scale and reach by providing insight into who your best customers are, which channels to reach them on, and when they are most likely to convert. Even if you don’t have a team of analysts, we make it easy to understand how your customers are making purchase decisions. Using Customer Scoring & Segmentation you can create not just reactive look-a-like audiences based on current campaigns, but also proactive audiences based on offline demographics, purchase behavior, and lifestyle patterns. Powered by an extraordinarily rich and regularly updated offline consumer dataset covering virtually every household in the U.S., Customer Scoring & Segmentation links disparate consumer channel touchpoints back to a persistent offline identifier, enriching your media strategy with demographics, purchase behaviors, lifestyle patterns, consumer attitudes, media consumption, and much more. And unlike other segmentation frameworks, Marketing Analytics & Segmentation is not an off-the-shelf, one-size-fits-all solution that ignores your unique business model. Rather Neustar layers your strategy and internal customer data onto tens of thousands of attributes to create actionable segments that are predictive of customers’ actual intent and behavior. Simply having data isn’t enough—you need to activate that data. PlatformOne uses the industry’s most accurate data to provide a comprehensive set of effective solutions for targeting customers and high-value prospects across every touchpoint. Maintain the consistency of your brand story while delivering the right message to the right consumer at the right time. Target custom audiences with relevant creative and messages on your website, mobile app, social media, search results, call center interactions, email, and much more. The Neustar PlatformOne Audience Planner gives you the transparency and control you need to optimize your media plan across all channels quickly and effectively. Market with confidence. Our data sources are authoritatively corroborated and validated with the Neustar OneID® system, so you know you’re reaching the same people, places, and things across your entire marketing campaign. Neustar’s Data Directory brings together audiences from dozens of leading data providers and makes them available through the PlatformOne Audience Planner. This robust collection of audiences allows marketers to build high-value custom audiences from a blend of top third-party data sources. Customers want their website experience to anticipate their desires and needs. But when most of your site visitors are unauthenticated and you are limited to onsite behavioral data, effective personalization becomes a serious challenge. A/B testing is too generic to be effective, and behavioral optimization takes time, and eventually plateaus. How do you drive incremental lift? Neustar PageAdvisor™ bridges the anonymity gap by providing you the user preferences and demographic data of your site visitors. Armed with the right data, you can efficiently expand your customer reach. Our identity layer works hand-in-hand with your website personalization solution to provide a targeted and relevant experience in real time. You’ve spent thousands to get a prospect to click on a banner or visit your site…but did they actually purchase? How many of your call center prospects drop before they reach a representative? Don’t just let these valuable leads go. Neustar Omnichannel ReMarketing™ identifies, quantifies, and targets non-converting prospects across all digital and offline channels, from the website to the call center. Deliver targeted offers to prospects who have shown interest—whether targeting through email, social media, mobile, direct mail, call centers, or display ads. OneID allows you to locate and reengage high-value prospects with the offers most likely to lead them to conversion. 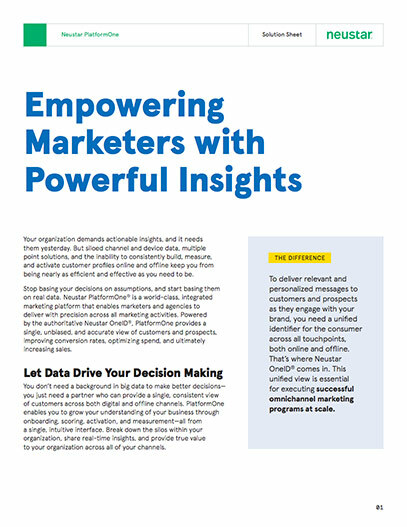 PlatformOne IDMP is a DMP for the real world, providing measurement and attribution to give you the transparency and clarity you need to understand the effectiveness of your marketing. Gain an unbiased and consolidated view of your marketing activity across formats, channels, and devices. Neustar can reach more media and sites than anyone in the industry, allowing you unparalleled reach in your media measurement. Data Collection: Gather any first-party and third-party data, website data, conversions, ad serving data, or click data with universal data collection. Marketing Analytics: Maximize your marketing ROI with best-in-class analytics to identify trends in media and audience metrics across all campaigns, evaluate exclusive reach and overlap, and select the best-to-reach performing audiences. Data Normalization: Get a single, consolidated view of your customers. As data is ingested, it’s parsed, mapped, and normalized to a common identifier, which allows you to compare it to other data, and against ad inventory and conversion data. Closed Loop Measurement: Evaluate the success of your campaigns accurately, by accurately crediting online and offline leads, sales, and conversions to the individual digital media campaigns that users are exposed to. Multi-touch Attribution: Assess the impact of each channel by processing all of your cross-channel marketing data—analyzing each conversion sequence, conversion rate, and all relevant data points. Assign the appropriate value to every media touchpoint.